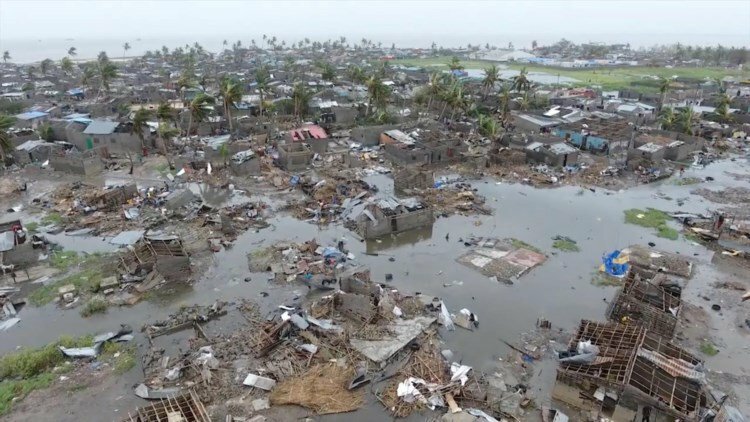 That is the only way to describe the destruc­tion left by Cyclone Idai. An esti­mated 1.7 mil­lion peo­ple are with­out safe homes, food, or safe drink­ing water through­out Cen­tral Mozambique. There is still no word from our orphan, Fatima, who is at busi­ness school south of the Beira area. We are believ­ing she is safe, as her school seems to be out­side the flood zone, but inside the cyclone wind zone. Many of her school mates are from Beira, mak­ing it dou­bly hard on them not know­ing where their fam­i­lies are. 1. RAPID RECOVERY for those still stranded in the flood waters. 2. SAFETY FOR THE RESCUERS risk­ing their lives to save those stranded souls. 3. FOOD SUPPLIES TO MULTIPLY, as the aid groups are strug­gling to help everyone. 4. COMMUNICATIONS/ELECTRICITY TEAMS to be able to restore power and phones soon. 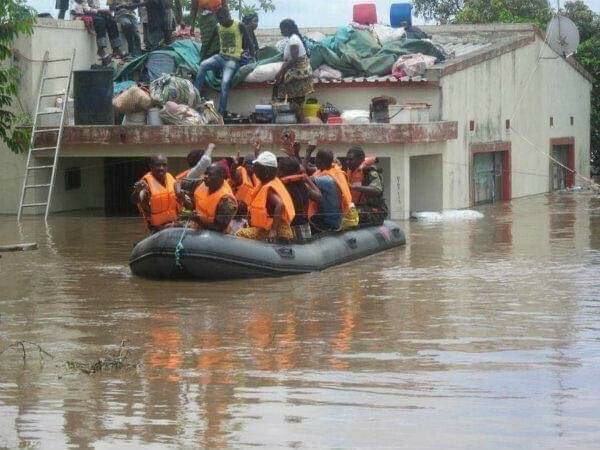 The res­cuers are fac­ing mon­u­men­tal tasks try­ing to air­lift or res­cue by small boats, over 13,000 peo­ple still stranded in the flood waters this week. It is esti­mated that the “SPRINT PHASE” of the res­cue efforts could con­tinue for another 2 weeks. THE MARATHON PHASE will go on for over a year, for these peo­ple will need food sup­port along with SEEDS to plant so that a har­vest is pos­si­ble in April, 2020. THANK YOU TO ALL WHO RESPONDED IMMEDIATELY AFTER THE RELEASE OF THIS STORY. YOUR GIFTS ARE HELPING MERCY AIR’S 2 HELICOPTERS SAVE 1000’S OF LIVES. Our goal is to keep them in the air for as long as needed. 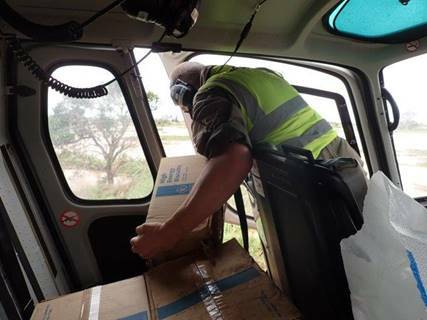 Mercy Air drop­ping food boxes in iso­lated areas. Mercy Air’s STAFF has adopted an orphan­age destroyed in the storm that hosted 26 lit­tle boys. Any funds donated for Cyclone Relief that end up not being needed for fuel have been des­ig­nated to help them rebuild the orphanage. THERE IS STILL TIME TO GIVE IF YOU WANT TO HELP! (See our giv­ing instruc­tions at the bot­tom of this blog post.) We will make a 2nd trans­fer to their account in a week’s time for gifts being sent this week. As long as they have fuel, Mercy Air’s 2 heli­copters will go out loaded with food boxes, med­i­cines, and hygiene pack­ets to those in remote areas where no roads exists. Together, we are mak­ing a dif­fer­ence, one life at a time. Thank you for all the emails ask­ing if we are OK. Balama is on HIGH GROUND, about 1,950 ft. (600 meters) above sea level. 1. House #6 con­struc­tion resumed last Mon­day with the erect­ing of the roof. As of today, half the roof is on, but we had to delay the 2nd half due to rainy weather. The foun­da­tion of their lunch room and kitchen is now in the ground. Builders lift­ing trusses into place. Roof­ing com­pleted on 1st half of house #6. Foun­da­tion on new kitchen/lunch room begins. 2. Meluco’s bridge has been given a tem­po­rary make-over. Just in time, for our March sup­ply truck leaves next week to take much needed items to the 515 orphans we sup­port in that area. My dri­ver is very happy, for he does not like shar­ing the back road through the game reserve with the Ele­phants or Baboons. Bless­ings to all of you, and thanks again for your prayers and gifts that are truly mak­ing a difference. Please email me if you are able to help. If I know your gift is on its way, I will pull from our emer­gency funds to speed up our help­ing hand. Make checks payable to Orphans Unlim­ited and please note CYCLONE RELIEF on the memo line of the check. Alter­na­tively, you can donate to us via Pay­Pal at this link and use the pull­down to indi­cate Cyclone Relief.